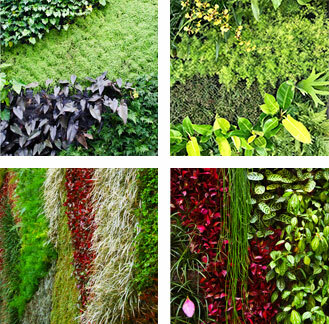 Vertical Gardens have the potential to increase the green space in dense cities. They transform bare architectural schemes, break the hardness of walls, refresh arid environments, and make spaces more humanized and sustainable, providing a fresher, cleaner air, well-being and joy for its users. Vertical Gardens are vibrant and vivid works of art, painted with a rich palette of colors, layers and textures that transform throughout the seasons, attract butterflies and birds and rescue some of the biodiversity in urban centers. Each Vertical Garden is exclusive and has a unique design for each Client, like a natural and handmade tapestry, where each species can reveal its maximum potential within a delightful, lively composition. WE ARE THE PIONEERS IN HYDROPONIC VERTICAL GARDENS. 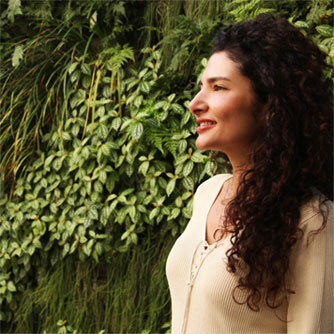 Talita Gutierrez was born in São Paulo, Brazil, in a house full of books, plants and colorful materials. Both of her parents were fine artists, so Art has always been an essential part of her life. Talita graduated in Architecture and Urban Planning at the Mackenzie University in São Paulo. Architecture allowed to combine her creativity and design with functionality and spatial sense. Passionate about natural landscapes and flora, she has incorporated this fascinating world into her work. After some years of research in Botany and Ecosystems, she developed an innovative Vertical Garden system that surprises everyone and transforms spaces. Since 2005, Talita has divided her time between her studios in São Paulo and Miami, working as a vertical garden designer and fine artist, collaborating with leading architects, landscape designers and direct clients. Her vertical gardens can be seen in beautiful façades, offices, residences, hotels, spas and restaurants, in several cities of Brazil, the US and the Caribbean. “ The idea of creating vertical gardens was born of my passion for natural landscapes and city life; of the desire to combine Nature and Art, mixing colors and textures in a living and mutant composition. The inspiration came from the lush and colorful landscapes of Brazil, from the lively sculptures of Roberto Burle Marx and from the Vertical Gardens –natural or manmade- I met during my travels”.